Ah... Italy in the summer. Imagine bathing yourselves in the soothing sun of Southern Europe. As you enjoy the warmth, the scent of pizza passes by, making you hungry. In the evening, you sit on a table outside with your friends, sipping red wine and munching one of those panini known for its crunchiness. Welcome back to One Theme Park at a Time! Today, we're going to take a look at the most visited theme park in Italy, Gardaland. Gardaland's minimalistic park entrance. Every morning, a flag opening ceremony takes place. Opened in July 1975, Gardaland is located next to Lake Garda in the Northeastern region of the country. Covering an area of approximately 35 hectares (in comparison, Magic Kingdom in Orlando is 40 hectares), Gardaland attracted close to 3 million guests in 2015, making it one of the "Top 10 Most Visited Theme Parks in Europe." In 2006, Gardaland was acquired by the themed entertainment giant from the United Kingdom (UK), Merlin Entertainments, whose portfolio of theme parks also includes Alton Towers, Thorpe Park, Legoland, amongst others. Since then, the park has gone under redevelopment according to the company's standards, which includes roller coasters and other rides that are typically found in other Merlin Entertainments parks, such as B&M Diver, B&M Wing, and Vekoma SLC. Gardaland is a relatively small theme park compared to, say, Europa Park. As such, you might not need an entire day to experience the best of the entire park. When I visited, I arrived early enough for the 10:00am opening. By 2:00pm, I did everything I wanted to do, leaving me wandering around aimlessly around the park. There are a few rides here and there that are worth riding. The key, as always, is to finish the rides that are popular AND have low capacity first thing in the morning, followed by the others that can accommodate more guests. If you want to maximize your day, I suggest you ride Raptor and Oblivion - The Black Hole first, followed by Sequoia Adventure. Then make your way to ride Blue Tornado. Mammut's capacity is rather high, so you can leave that anytime you want. 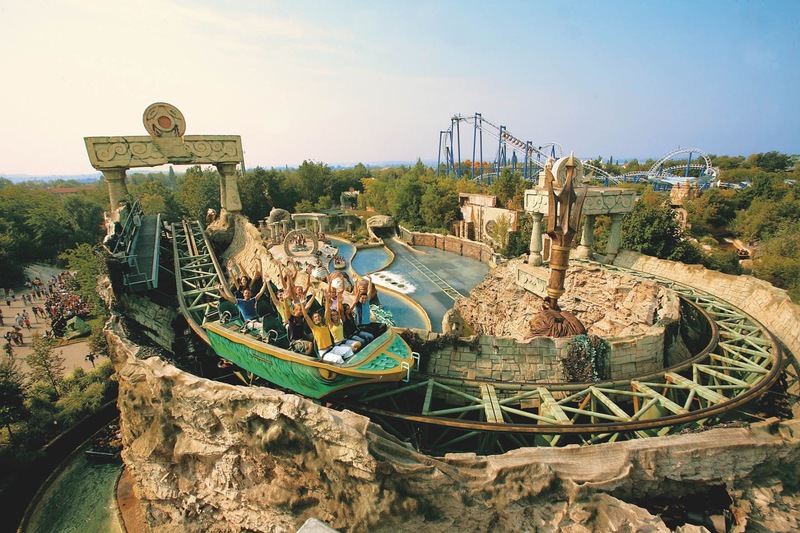 If you don't mind getting wet early in the morning, then certainly go ride Fuga da Atlantide, an Intamin flume ride that is excellent to freshen yourselves up in the Italian summer heat. Gardaland is located next to Lake Garda. The surrounding neighbourhood is lovely and quiet. Measured at 35 hectares, Gardaland isn't actually that large. From one end to another, the entire park can be simply walked from one furthest corner to the other in a mere 15 minutes - that is from the Atlantis Supersplash ride to the Sequoia Adventure roller coaster. One thing that you need to prepare when visiting Gardaland, however, is a comfortable footwear. While the park isn't that big, the terrain proves to be challenging to conquer. Due to the fact that Gardaland utilizes terrain surface throughout the park, the paths can be to steep for some guests. It also doesn't help that there are a lot of stairs throughout the park, making accessibility rather a challenge to overcome. Remember to wear comfortable footwear for your Gardaland visit to help you overcome the challenging terrain. Additionally, similar to the parks under Merlin Entertainments' portfolio, the park does a decent job in terms of landscaping and theming. While they're still sub-standards compared to those of Europa Park, for example, they're still solid nonetheless. One thing that surprised me was how safe the park is. I don't know whether it's an Italian culture or something, but theft is basically a big NO-NO in this park! A lot of rides at Gardaland have small loading // unloading stations, hence the absence of space to leave your belongings. Gardaland's solution? Just leave your bags wherever before you ride. I can't ever imagine doing the same thing in China - even at Shanghai Disneyland. Guests comfortably left their backpacks without surveillance whatsoever despite the absence of lockers. For all of you coaster freaks, Gardaland has a decent number of roller coasters: 8. So if you're working on your coaster count, this could add up significant number to your list. The bad news, however, is that all of the coasters are rather on the shorter side. The longest coaster in the park measures at less than 3,500 feet, which - if you ask me - is extremely short. Some rides are notably constructed and designed better to utilize the natural terrain of the park. Let's get down to business right away then! Billed as the most intense roller coaster at Gardaland is Raptor, a B&M Wing coaster located in the middle of the park opened in April 2011. Raptor, in my opinion, is the one ride that puts Gardaland to the international headline back then. What is so significant about Raptor is that it's a prototype roller coaster - meaning it is the first of its kind worldwide when it opened. Raptor utilizes the natural terrain in the area, creating an exciting experience. On Raptor, riders sit on either side of the track rather than on the track, hence the name of the model "Wing Coaster," because the guests are experiencing the roller coaster from the wings of the roller coaster rather than over the main track. When it opened, the prototype model drew some hesitances from coaster fans worldwide, many citing it to be forceless and lacking excitement. Many others worried that the roller coaster will be painful and uncomfortable, comparing it to the like of Intamin's Furius Baco at PortAventura. Yes, I'll admit that Raptor is definitely not an intense roller coaster. If you're expecting to be terrified at the edge of your seats the entire time, let me just straight tell you that you'll be disappointed. 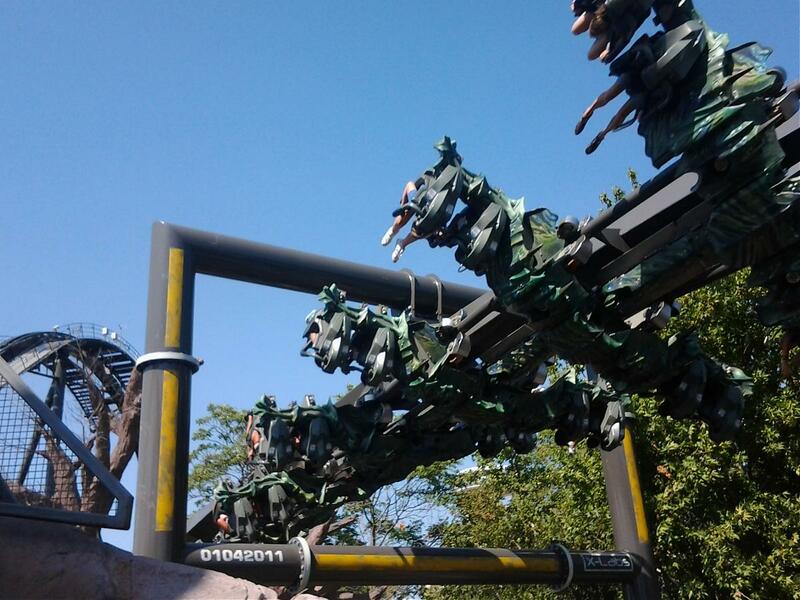 Raptor's first drop was built to mimic a monster descending upon a Western town. A train went down the first drop of Raptor. Rather, Raptor makes use of the surrounding terrain cleverly. The trains on this coaster model have their seats at the side of the tracks. As such, B&M utilizes a lot of turns, swoops, and inversions through plenty of near-misses moments and special effects in order to mimic a flight of a monster wreaking havoc a military facility. Throughout the ride, Raptor takes the guests upside down up and down bridges, swooping through the creeks, interacting very closely with the physical terrain and structures created for this one single attraction. Needless to say, Raptor wins the guests' hearts for its excitement rather than for the roller coaster itself. Raptor passing through a structure. Notice the "close call" the riders have. Considering the fact that Raptor is a prototype coaster, Gardaland did an excellent job in introducing the model to the world by characterizing it as a roller coaster to utilize near-misses, close calls, and special effects. Despite the fact that the ride itself is not as intense as I hoped for, the theming work around this roller coaster is commendable. Not quite there at the top of my list, but great job. 8/10. Another B&M coaster in the park is a B&M Diver, a smaller model of its kind with a height of around 100 feet and a track length of below the ~2,000 feet mark. My first impression when I saw this coaster was to compare it right away to the same coaster of the same name at Alton Towers, except that this one goes upside down twice and has a nice airtime hill towards the end of the ride. Oblivion - The Black Hole's queue is themed to a space exploration of the black hole. Oblivion - The Black Hole sends the riders down a 90-degree, 100 feet tall drop. I don't know what is so fascinating about B&M Diver. Despite the fact that this model is copied again and again around the world, B&M Divers are always such delight to ride and watch. I personally love the moment when the trains stop at the top of the first hill, facing straight down the vertical drop. I also love looking up and watching those people screaming at the top of their lungs at the bottom of the drop. I think it's that B&M Divers evoke the best of people's reactions: terror or excitement, happiness or stress. The bad news is that Oblivion - The Black Hole is really short. You go down the drop, go upside down, airtime hill, turn, upside down, and then brakes. That was it. Nothing else. A fully-loaded train on Oblivion - The Black Hole goes through the first inversion following the vertical drop. Oblivion - The Black Hole remains an excellent addition to Gardaland nonetheless. While the ride experience itself is short, it's definitely an attention-grabbing attraction that solidifies the park as one of the thrill park destinations of Southern Europe region. 7/10. From a short roller coaster, now let's go to the other side of the roller coaster line-up: the longest roller coaster at Gardaland, Mammut. Mammut is a Vekoma Mine Train coaster measures at 3,380 feet long, which - despite being the park's longer roller coaster - isn't that long in retrospect. Unlike Oblivion - The Black Hole, Mammut also has the park's longest roller coaster on-ride time, which is around 4 minutes or so, thanks to its 3 lift hills throughout the course of the roller coaster. Despite the massive line, Mammut's waiting time never exceeded 40 minutes. Thanks to its high capacity train (32 riders per train), the queue for Mammut moved much quicker than other more popular rides at the park, including Raptor. It also helps a lot that Mammut is a much more family-friendly roller coaster, making it a great option for the entire family and for those who are not quite up there yet to conquer the more intense roller coasters at the park. Mammut is themed to the exploration of ice age, as shown by the seemingly snow-capped mountains and mammoth fossils throughout the attraction. From beginning to end, Mammut takes the riders up with its 3 chain lift hills, starting with the lowest (40 feet high) to the highest (45 feet high). Similarly, the downhill experience gets more intense and forceful as the course goes, which makes the pacing rather enjoyable. Smaller guests will especially find this great since they get to warm themselves up before experiencing the grand finale. Mammut takes the riders in and out of the mountainous structure. Notice the massive line. Is it a unique coaster? No. But do the guests enjoy the ride? Yes. 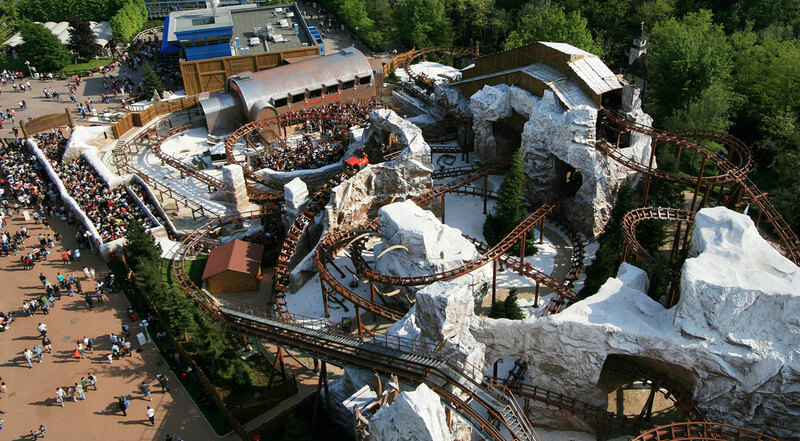 Mammut is a strong attraction of the park thanks to its status as a family attraction. The staffs that operate this attraction also did a tremendous job in keeping the waiting time short during my visit. While not a must-ride attraction, it's certainly one that you'll thoroughly enjoy regardless. 7.5/10. Looking for another unique roller coaster at the park? Then Sequoia Adventure will fulfil your desire with its insane and dizzying hang time. As one of the only two remaining Screaming Squirrel models worldwide - I have no idea how they got the name Screaming Squirrel, seriously - Sequoia Adventure is a must-ride because simply there's no other coaster like it on the planet. The entire course of Sequoia Adventure. Notice the 3 saxophone inversions. The idea of Sequoia Adventure is very simple: take the guests up a 100 feet tall hill, then send them down through 3 saxophone inversions as they go down to the ground. It's not surprising, as such, that Sequoia Adventure is actually an incredibly slow coaster. I think the train never exceeds more than 20 mph - which for my standard is very slow, really. In Sequoia Adventure, however, slower means more intense. Thanks to its low speed, guests spend more time being upside down, which is the main point of the roller coaster itself. But, oh gosh... this ride is painful. Because of the sturdy and hard should restraints used on the trains, I experienced massive pain and discomfort on my shoulders and neck whenever the train went upside down. Sequoia Adventure's X-factor is its upside down parts, which leave the riders hanging for a couple of seconds. By the time I got off the ride, I had a contrasting thought: on one hand, I was happy that I got to experience this one-of-a-kind roller coaster; one the other hand, I was grateful that the ride was over so quickly. Yes, Sequoia Adventure is definitely a unique roller coaster that has to be experienced at least once. But after that, skip it if you don't want a headache or shoulder pain. 4/10. Located at the newest section of the park, Fuga da Atlantide definitely gives passer-bys the urge to experience the attraction themselves, especially if it happens to be a hot, sunny day. Do you think Fuga da Atlantide is a water coaster or a flume ride? Fuga da Atlantide is without doubt the best themed attraction at the park. In fact, it seems the entire surrounding area is themed with this ride alone as the central point, consisting of the same Atlantis theme, ranging from the bathrooms to the shops and the stalls. Throughout the course of this ride, riders experience 2 splashdowns: one at the beginning (a smaller one) and one towards the end of the ride (the one in the picture above). Unique to this attraction is its lift hills. Instead of using traditional chain lift hills, the attraction uses cable lift hills that can be typically found on Intamin's giga coasters like Millennium Force. Riders take a left turn before tumbling down the first drop. Fuga da Atlantide is hugely popular in the summer. As such, be prepared to wait longer than expected on hot, sunny days. It's definitely a crowd pleaser to everyone who wishes to freshen up. Note, though, that you won't get completely wet on this ride. The splashes at the bottom of the drops are rather, well, controlled - if you know what I mean. 8/10. Blue Tornado, which was at one point the signature roller coaster and attraction at the park for 10+ years. This Vekoma SLC, however, seems to have seen better days. Not only the ride is jerky, there's literally no way you can avoid banging your heads on those hard shoulder restraints. Go on this ride when you still have the energy; otherwise, you'll get neck strains and headache afterwards. 4/10. Blue Tornado is one of the largest Vekoma SLC coasters in the world. Magic Mountain, a Vekoma Double Corkscrew coaster with new, more open Vekoma trains. The ride is considerably smoother and more enjoyable compared to similar coasters worldwide. The coaster was renamed in 2016 to Shaman by utilizing Virtual Reality (VR) goggles. 7/10. Space Vertigo, a 135-foot Intamin drop tower ride themed to an escape from bacteria infection or something like that... I couldn't really follow the storyline because it was in Italian. Decently themed and definitely a nice drop ride, although over very quickly. 6/10. Space Vertigo and Oblivion - The Black Hole as seen from a distant point. The rest of the park consists of more minor rides that are rather enjoyable for impulse riding but not necessarily must-ride(s). For these rides, I decided to skip them either because I found the queue time to be too long or simply because I've been on similar rides elsewhere. The new mini-land Kung Fu Panda Academy at Gardaland, consisting of a junior spinning coaster. Fantasy Kingdom, Gardaland's area dedicated for smaller children (infants and juniors). Overall, I found Gardaland to be generally satisfying, even though the park lacks a strong line-up of roller coasters and rides for adrenaline junkies and thrill seekers. However, those who don't have particularly strong fondness towards theme parks in general would see Gardaland as a destination at all. Raptor's train going up the lift hill. Truth be told, the only reason Gardaland made it to the international headline in the first place was because of the opening of Raptor in 2011, which at the time was a brand new prototype by B&M. At the time, it was interesting because the idea of a Wing Coaster had not been implemented as often due to the complexity of creating smooth and enjoyable rides. Merlin Entertainments' takeover clearly improved the park significantly, albeit making the park feels very Merlin-y, from the way the park feels to the way the park looks, as well as the selection of rides. The long pathway that basically leads to nothing: no toilets, no benches, no trash bins. Could this be a sign of future expansion? Another area that I found puzzling, but not necessarily bad, is how empty certain parts of the park are. For example, there is a very long pathway (pictured above) with literally nothing on it. No attractions, no benches, not even trash bins except at the very end by a garage (which has an ambulance in it, whoops). Could this be a sign of future expansion? I mean, look at that tall green plant walls at the right. What could they be hiding behind those walls? The Atlantis themed area is nicely done, in general better than the rest of the park. I take it that this was done after Merlin's takeover. Yet most of the shops and stalls in this area were closed during my visit. At some corners, where there were fewer people, I found it a bit eerie to walk around without anyone else around. It's certainly a nicely themed area... but the shops and the stalls are closed nonetheless. I found Gardaland to be generally satisfying, though I'm not sure I would do a repeat visit unless they open something really REALLY worthwhile. Nevertheless, Gardaland makes a nice detour if you're looking for something different to do when you're in the area, like in Milan or Verona, for example.